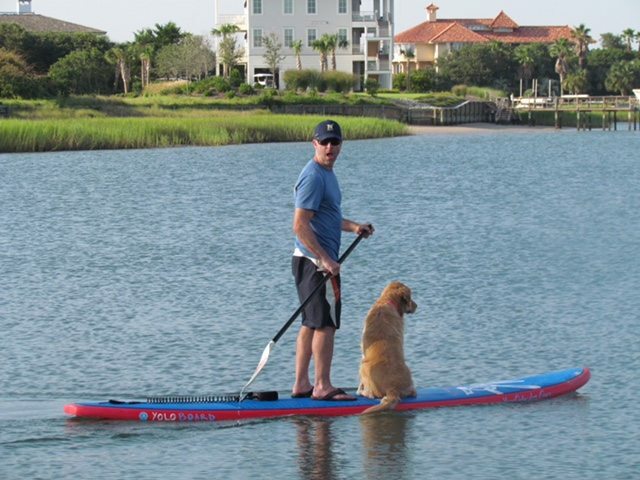 My family is extremely active and we take trips that involve the outdoors, and not just going to the beach. The last couple of years our big trips were to Alaska and a dude ranch in Wyoming. These trips we could not take our dog, but any chance we get we take her outside hiking or for a swim at the nearby river. 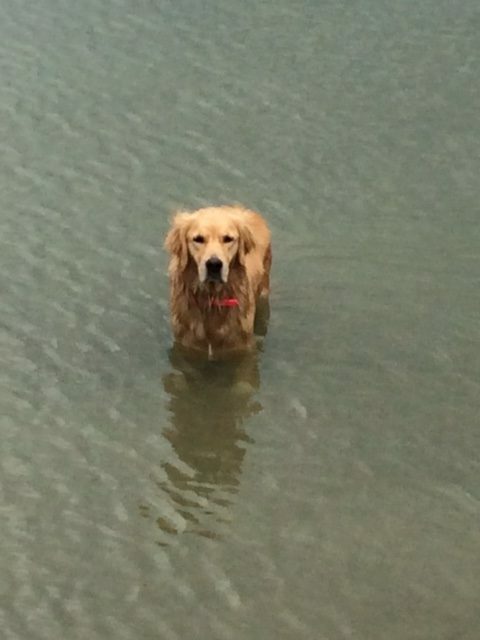 We often will plan a vacation with her in mind as she loves to swim and hike with us. 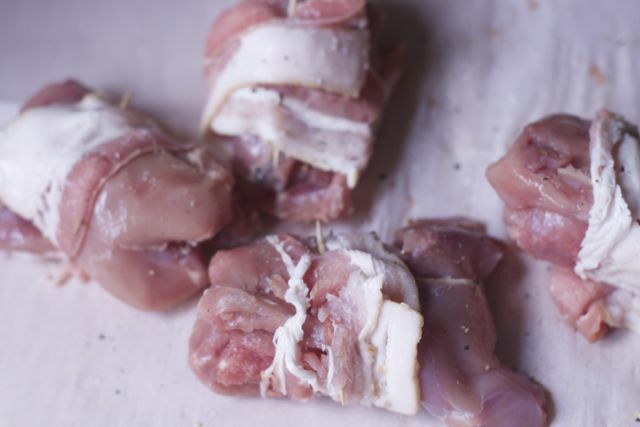 Living in the South the past 17 years has brought about a lot of new experiences which includes having quail meat in my freezer. I have never eaten or prepared game meat before so this has been a brand new experience. 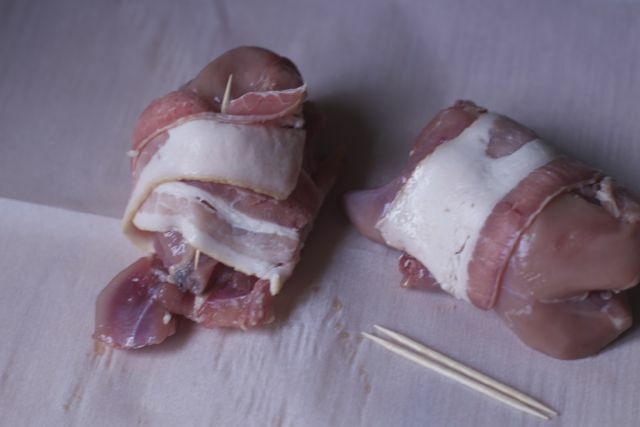 The best cooking solution for quail is wrapping it in bacon. Everything tastes better with a little bacon. 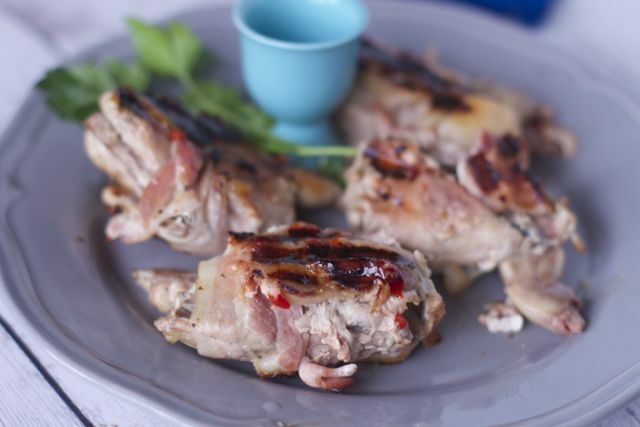 We have had a few quail dinner parties and our guests really enjoy this Grilled Quail with Bacon and Pepper Jelly Recipe that is easier than you would imagine. Fortunately for this Midwestern girl, our quail comes cleaned and packaged in airtight bags. 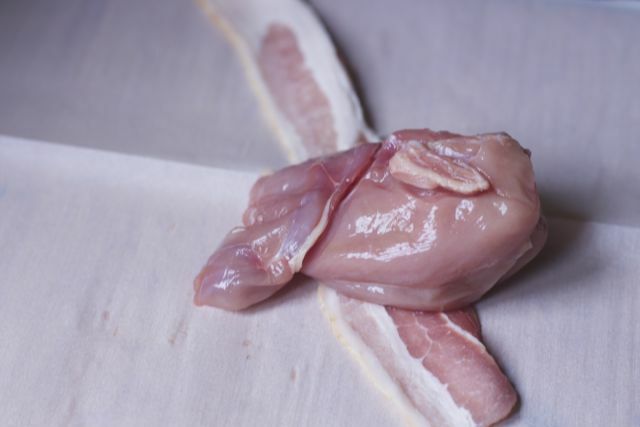 In reality, once quail is dressed, the actual meat portion is very small and plan on at least two per person for an appetizer and four quail per person as an entree. ** Dressed means all the feather etc taken off. Be sure to secure the bacon with a toothpick so it stays together on the grill. 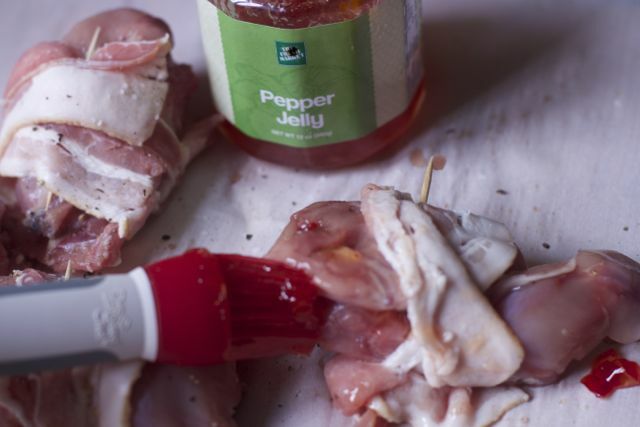 Salt and pepper the quail and splatter some Red Pepper Jelly for an extra flavor punch. Grill the quail for about ten minutes on each side but be sure to reglaze each side when your turn the quail. 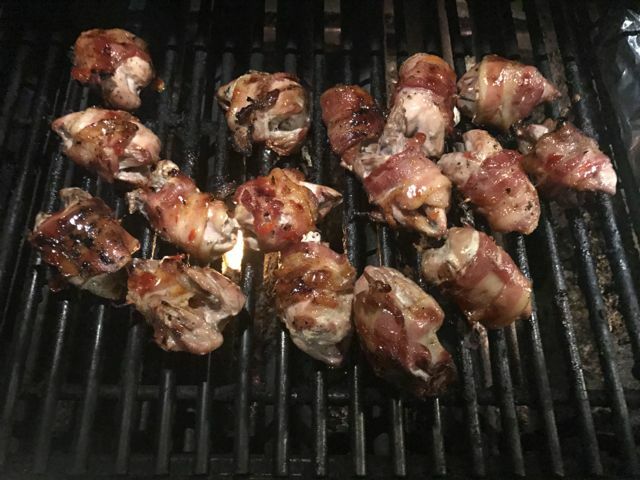 Grill your quail on indirect heat as you don’t want the bacon burning before the quail meat is cooked. Game bird is not for everyone but does make for a fun party. Why should adults have all the fun with thier food? 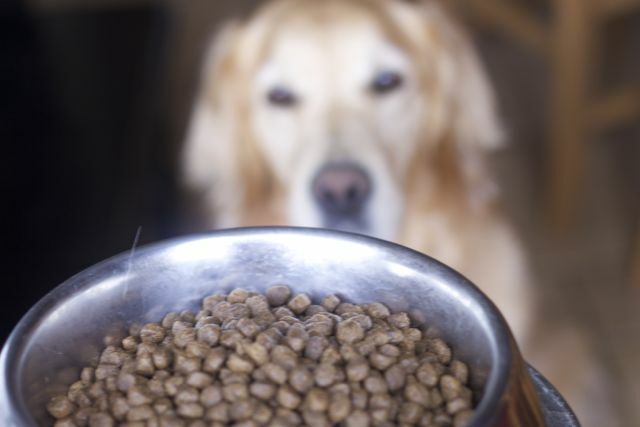 What about feeding your pets fine ingredients too. 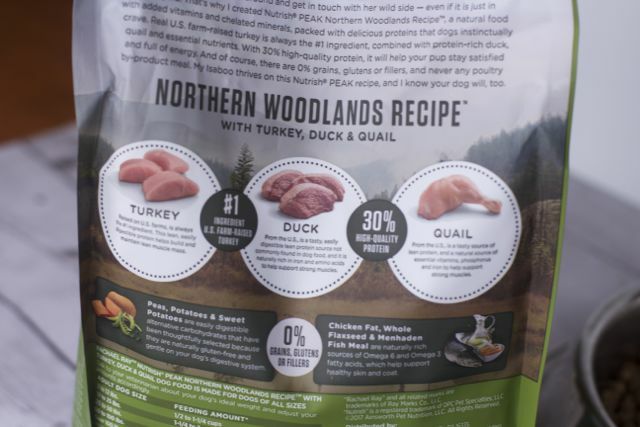 Be sure to try Rachael Ray™ Nutrish® PEAK Northern Woodlands Recipe™ with Turkey, Duck & Quail dog food but download this coupon first to Save $4.00 on PEAK Valid throughout this year. (You can print this coupon twice). 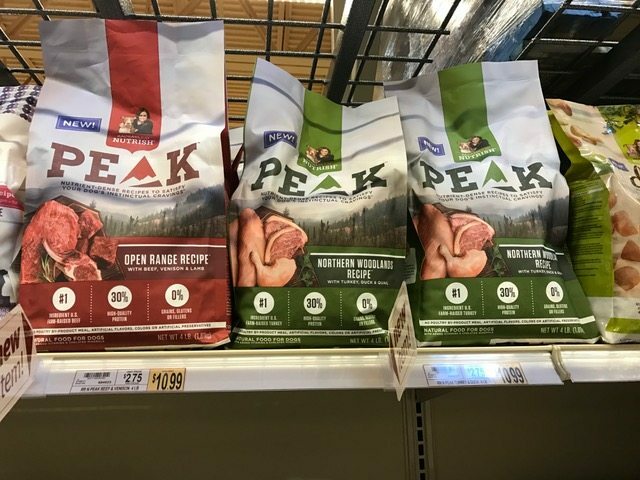 Our dishes look a lot different but knowing we both have quality ingredients means a lot to this pet parent. • Preheat grill to medium-low. cooking until the birds are nicely glazed and grilled on all sides and the meat is just cooked enough, about 10 minutes longer. • Set aside to rest briefly before serving. What type of game have you eaten before? 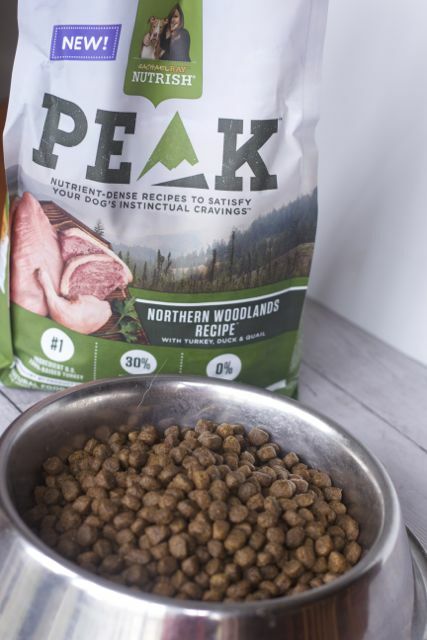 What do you like about the Rachael Ray™ Nutrish® PEAK Northern Woodlands Recipe? Oh my goodness! I’m going to try this today! This is really fantastic recipe my family will surely love it as well. I’ve never had quail and preparing it I have no clue about. haha I’m sure my husband would, though! Oh, this is going on my recipes wishlist. I can’t wait to taste it. this is our first time with her food, thanks for stopping by to remark. Chloe does know she is adorable too…. works against us!! I am always looking for new recipes to try. This looks so delicious and easy to make. I will have to get the ingredients I need to make some this weekend. 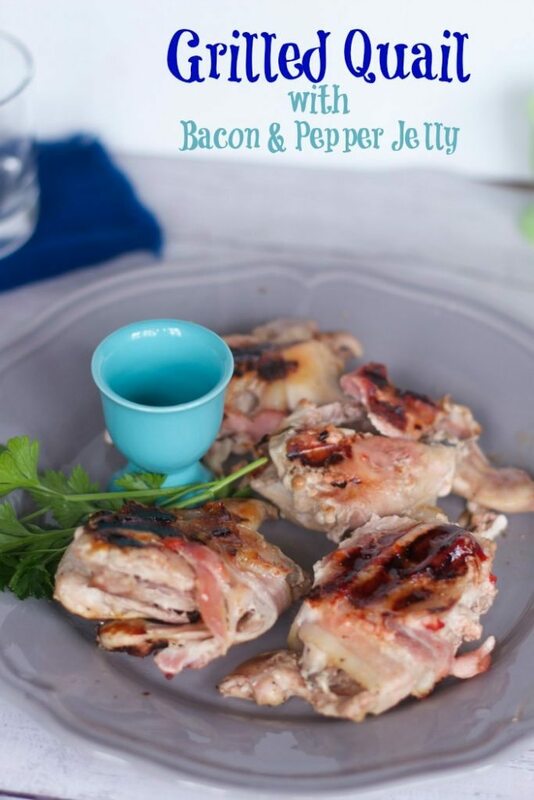 You idea to put bourbon pepper jelly on grilled meat sounds DELICIOUS! We live in Florida and grill all year round, so this recipe is great for us. Okay, first of all, I love your dog. Second of all, I’ve never even tried quail before, but this looks really tasty! I need to broaden my horizons a little because I’ve never had quail before. You mentioned it isn’t for everyone, but with bacon I am pretty much guaranteed to love it.